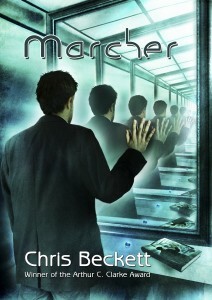 I just received a copy of the new Marcher today from Ian Whates at NewCon press. It’s always a lovely feeling, that first time you put your hands on the actual physical book. And I love the cover image by Ben Baldwin, loosely based on the famous painting by Magritte: ‘Not to be reproduced’. The book won’t be available for sale until the August launch at Loncon.